Microsoft Office 365 is a cloud-based solution, hosted on Microsoft’s servers. This means that Office 365 can be accessed wherever and whenever a user chooses. Office 365 is activated by a user purchasing a monthly licence. Once this is purchased, the user can access Office 365 applications on any device they choose. This includes Outlook emails, Word, Excel and Office 365’s other applications. 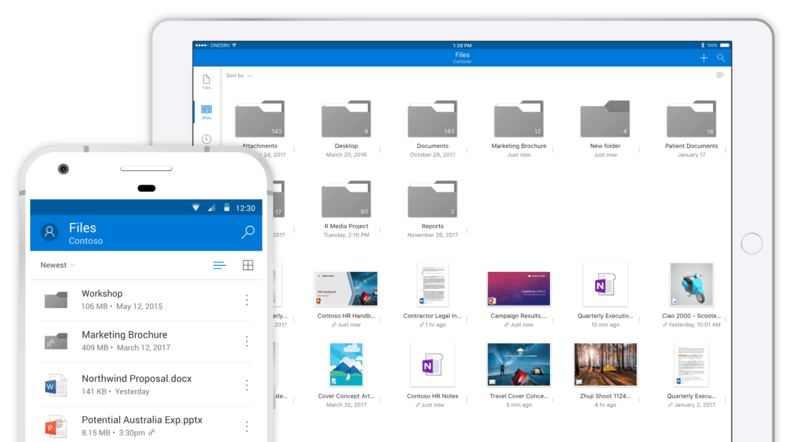 Users can also access all of their documents from any device, thanks to Microsoft OneDrive. This allows for documents to be saved in the cloud and accessed on the go. They can also be shared with colleagues. The cloud storage included with Office 365 can save organisations on the cost of data storage (and the associated server costs), with the added benefit that data is available everywhere. If you’re worried about an internet connection, Office 365 is also available offline. Users can save applications to their laptop or PC for use when there’s no internet connection. Documents can then update within OneDrive when a connection is re-established. Also, Office 365 benefits from flexibility of licensing. Microsoft offers Office 365 on a monthly rolling licence. So if your business no longer needs a licence (in the case of a staff member leaving) or needs to add new features found on a more expensive licence, you can make changes accordingly. Because Office 365 is cloud-based, you’ll always be using the most up-to-date version. Microsoft performs updates to Office 365 on their servers, so you won’t have to worry about performing updates to your PC. This brings an end to the old problem of staff having different versions of Office. In the past, having multiple staff members work on a Word document using different versions would result in versioning issues. When the same applied to PowerPoint, presentations would end up with features that wouldn’t work on colleague’s PCs. Using Office 365 guarantees all staff are using the same version of applications, so there’s no risk of being left with a document you can’t open or features you can’t see. Speaking of staff all working on documents together, Office 365 actively supports collaborative working. Businesses can set up a SharePoint instance to give all staff access to important work documents, or use OneDrive if only a few people need access. Best of all, all parties can work on the document simultaneously if needed, with Office 365 providing warnings about any potential conflicts if two people are trying to change the same content. Office 365 also includes Microsoft Teams, an application dedicated to supporting project working. Similar to a social message board, Teams allows users to store documents, provide updates on progress or hold online video meetings. And as Office 365 is available on any device, you can converse and work on documents on-the-go if need be. With the flexibility of access to documents, some organisations may have concerns about the security of their information. If this is a concern, you can activate permission levels within SharePoint and OneDrive so that only certain people can see sensitive documents. Documents can also be locked as read-only files, preventing edits from being made. Businesses can also rest assured about the overall safety of their data. Hosted in Microsoft’s datacentres, they are protected by Microsoft’s market-leading security, with your data constantly secured and monitored. Office 365 also receives regular updated to protect it from any emerging threats, all of which Microsoft implement without the user needing to take action. For extra security, Microsoft also replicates your data between their data centres. So should hardware unexpectedly fail, or a data centre be affected by a natural disaster, your data remains safe in another data centre where you can access it. Of course, one of the main Office 365 benefits is how well known Office is as a solution. While free solutions such as Google Documents or similar can be tempting, Office 365 supports staff with its instant familiarity and wide compatibility. You can also be sure of the safety of your information (not guaranteed by free software providers). While some more complex elements may require a little bit of training, most staff will be able to get most Office 365 benefits instantly, meaning that no training is required. If you’re interested in implementing Microsoft Office 365 for your organisation, please get in touch.